This how-to guide shows you how to deploy your code to Azure App Service from a Git repository on your local computer. Maintain a local Git repository with code you want to deploy. To get automatic builds from the Azure App Service Kudu build server, make sure that your repository root has the correct files in your project. WebJobs <job_name>/run.<extension> under App_Data/jobs/continuous (for continuous WebJobs) or App_Data/jobs/triggered (for triggered WebJobs). For more information, see Kudu WebJobs documentation. 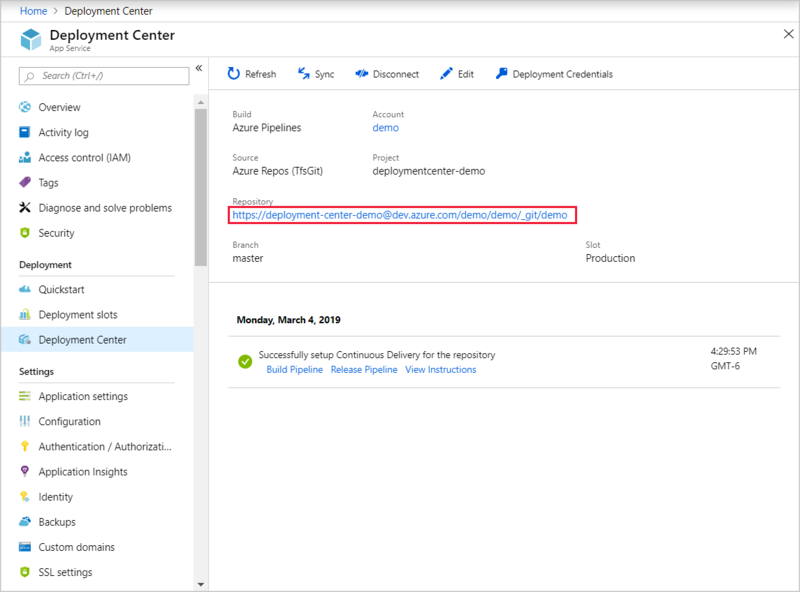 Functions See Continuous deployment for Azure Functions. To customize your deployment, include a .deployment file in the repository root. For more information, see Customize deployments and Custom deployment script. If you develop in Visual Studio, let Visual Studio create a repository for you. The project is immediately ready to be deployed by using Git. The easiest way to enable local Git deployment for your app with the Kudu build server is to use the Cloud Shell. To enable local Git deployment for your app with the Kudu build server, run az webapp deployment source config-local-git in the Cloud Shell. To create a Git-enabled app instead, run az webapp create in the Cloud Shell with the --deployment-local-git parameter. Back in the local terminal window, add an Azure remote to your local Git repository. Replace <url> with the URL of the Git remote that you got from Enable Git for your app. Push to the Azure remote to deploy your app with the following command. When prompted for a password, make sure that you enter the password you created in Configure a deployment user, not the password you use to log in to the Azure portal. You may see runtime-specific automation in the output, such as MSBuild for ASP.NET, npm install for Node.js, and pip install for Python. Browse to your app to verify that the content is deployed. 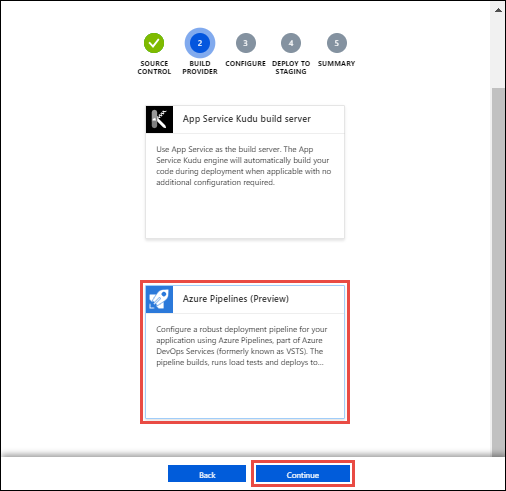 For App Service to create the necessary Azure Pipelines in your Azure DevOps Services organization, your Azure account must have the role of Owner in your Azure subscription. To enable local Git deployment for your app with the Kudu build server, navigate to your app in the Azure portal. 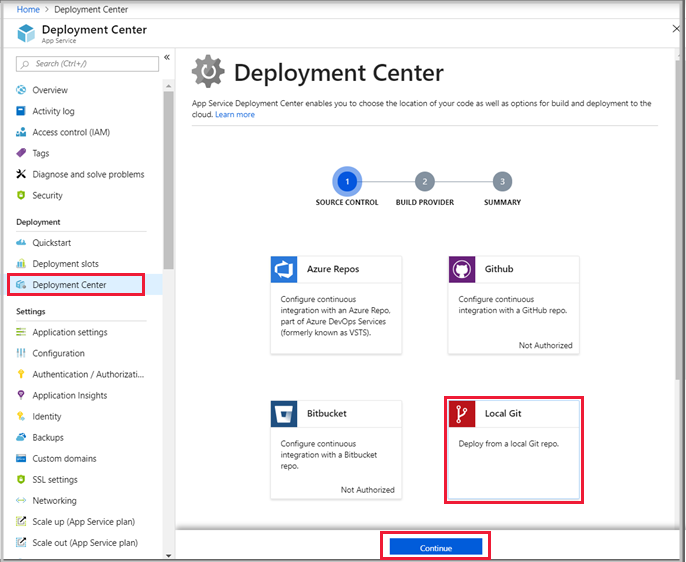 In the left navigation of your app page, click Deployment Center > Local Git > Continue. Click Azure Pipelines (Preview) > Continue. In the Configure page, configure a new Azure DevOps organization, or specify an existing organization. When finished, click Continue. If you want to use an existing Azure DevOps organization that is not listed, you need to link the Azure DevOps Services organization to your Azure subscription. Depending on the pricing tier of your App Service plan, you may also see a Deploy to staging page. Choose whether to enable deployment slots, then click Continue. In the Summary page, verify your options and click Finish. It takes a few minutes for the Azure DevOps Services organization to be ready. When it's ready, copy the Git repository URL in the deployment center. Back in the local terminal window, add an Azure remote to your local Git repository. Replace <url> with the URL you got from the last step. Push to the Azure remote to deploy your app with the following command. When prompted by Git Credential Manager, sign in with your visualstudio.com user. For additional authentication methods, see Azure DevOps Services authentication overview. Once deployment is finished, you can find the build progress at https://<vsts_account>.visualstudio.com/<project_name>/_build and the deployment progress at https://<vsts_account>.visualstudio.com/<project_name>/_release. What happens to my app during deployment? Stop your app or enable offline mode for your app during deployment. For more information, see Dealing with locked files during deployment. Deploy to a staging slot with auto swap enabled. Use Run From Package instead. Cause: This error can happen if the app isn't up and running. Resolution: Start the app in the Azure portal. Git deployment is unavailable when the Web App is stopped. Cause: This error can happen if the address information entered when creating the 'azure' remote was incorrect. Resolution: Use the git remote -v command to list all remotes, along with the associated URL. Verify that the URL for the 'azure' remote is correct. If needed, remove and recreate this remote using the correct URL. Symptom: No refs in common and none specified; doing nothing. Perhaps you should specify a branch such as 'master'. Cause: This error can happen if you don't specify a branch during git push, or if you haven't set the push.default value in .gitconfig. Symptom: src refspec [branchname] does not match any. Cause: This error can happen if you try to push to a branch other than master on the 'azure' remote. Symptom: RPC failed; result=22, HTTP code = 5xx. Cause: This error can happen if you try to push a large git repository over HTTPS. Symptom: Error - Changes committed to remote repository but your web app not updated. Cause: This error can happen if you deploy a Node.js app with a package.json file that specifies additional required modules. Malformed package.json file: npm ERR! Couldn't read dependencies.